The way energy is being sold is misleading. We’ve just gotten used to it. It’s strange that the issue hasn’t received more attention. Consumer energy has a weird quirk in how vendors talk about prices and savings. The effect is that households are regularly misquoted and end up in the wrong deal. It comes down to the fact that sellers market on the basis that everyone is average. 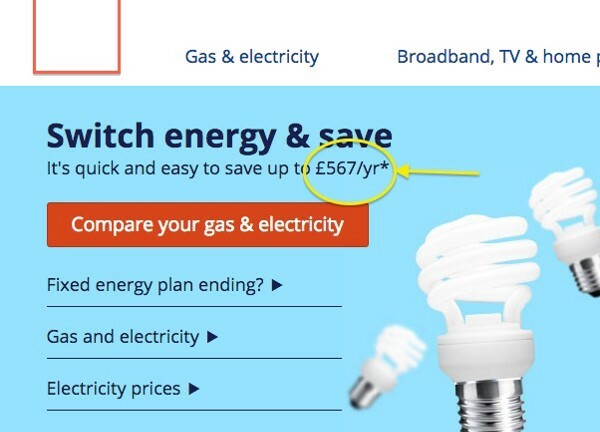 Claims like “We’ve launched the UK’s cheapest ever deal at £787 a year*” are misleading. That deal does not cost £787 a year for most people. It could just as well cost you £78.70 or £7,870 a year depending on how much energy you consume. It also won’t be the ‘cheapest ever deal’ for many of the people who see the advert. As the ‘*’ section in the small print indicates for those inquisitive enough to check, the price shown on the advert is based on an assumed average consumption level. May not be the cheapest for you and probably won’t cost you £787! The advertised prices are different to what most households would actually end up paying per year. This is bad for trust. Actual energy costs in your home are always based on how much you use. The relative annual costs of the various deals on the market for you depend largely on your consumption too. This is a concept that’s hard to translate into an attractive marketing offer based on price, because most people don’t instantly understand how unit rates and standing charges relate to them. So adverts employ average consumption numbers as a way to create annual prices. This enables them to use words like ‘cheapest’ that we get within a split-second. 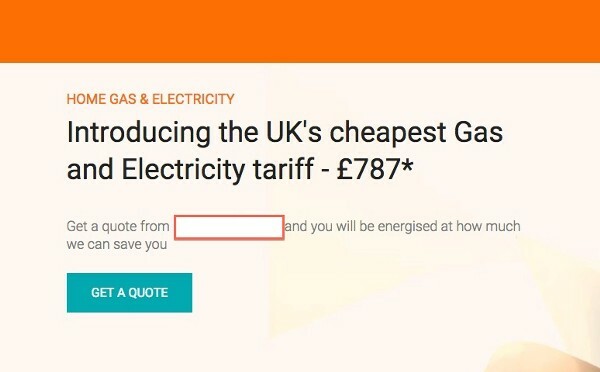 It’s more down to the License Conditions that Ofgem puts on energy sellers than the marketers themselves. The regulations oblige them to include an estimate of the annual cost when marketing a tariff. What could they feasibly offer to a general audience that would be better than the average? 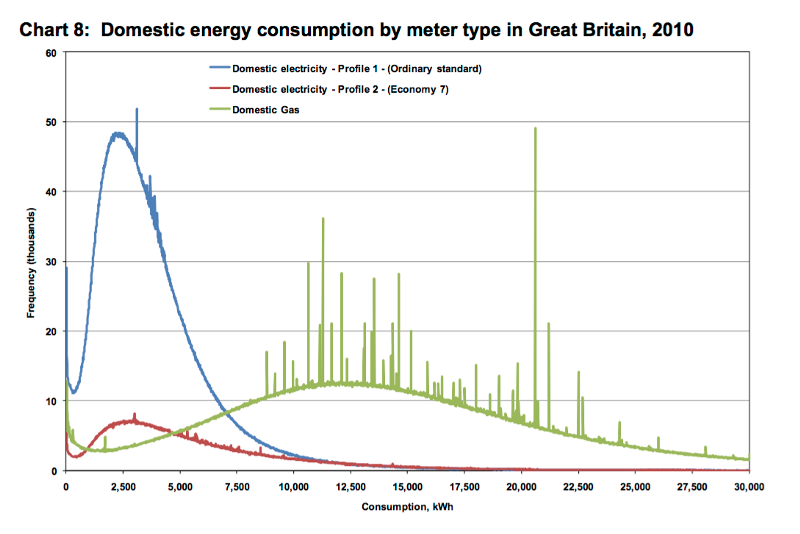 The frequency of annual kWh consumption of electricity and gas by UK households most vividly paints the picture of how energy consumption is very difficult to predict with averages. The distribution tails are fat — meaning that a relatively high proportion of households consume at levels far from the average. There are also huge, unpredictable spikes, especially within gas (although this could just be due to the way estimated bills are being calculated by British Gas). The blue line represents electricity for most households (all the non-Economy 7 meters). If you look at the frequency reading for 3,100kWh, the top of the blue curve — it does not represent a very large number. Specifically, less than 50,000 out of the 22+ million UK households that buy energy via the National Grid are at exactly 3,100kWh for electricity. Even fewer are exactly average for gas. A very high majority of households are clearly nowhere near average. This is why the advertised tariffs are not the cheapest for everyone viewing the advert. For the many households whose consumption is above the average (to the right of 3,100kWh for ekectricity), a tariff with a lower unit rate and higher standing charge would be cheaper than the advertised ‘cheapest deal’. Vice versa would also be true for lower than average consumers. There may be tariffs that are cheaper for many households than the advertised ‘cheapest tariffs’. This isn’t evident from the advert. Once a consumer has viewed an advert, they may, if enticed, visit an energy supplier or price comparison website where they can get a quote. This comes in the form of an ordered list of estimated annual costs for various available energy tariffs, based largely on your consumption. For some, these quotes are a better estimate of the annual cost of the various tariffs for them —mostly, if they are diligent enough to input the correct consumption information from their bills. For others, the estimates produced by the sites are not much better, or could even be worse in some cases. In order to get a quote without checking bills, you are presented with the option to rate yourself as a Low, Medium or High electricity and gas user. Or you may fill in information about your property (usually the number of bedrooms) and lifestyle. Answering these relatively easy questions can be an attractive alternative to digging up bills and looking for annual consumption information. However, the estimates produced this way can be very inaccurate. Some websites simply use the Low, Medium and High energy consumption averages published by Ofgem. Others have developed more sophisticated, though not necessarily more accurate ways of estimating. It’s hard to rate yourself as a Low, Medium or High energy user. It’s very easy for people and websites alike to guess this wrong. Property size is generally known to be one of the best available individual predictors of consumption. Other factors like how warm you like to keep your home can be used to try and make estimates better. LMH and other estimates probably won’t predict your consumption very well. Ofgem averages are generally very bad predictors of consumption — The average error rate (ie. the average difference between the estimate vs the actual consumption) given by the Ofgem LMH average here is 98% for electricity and 93% for gas. 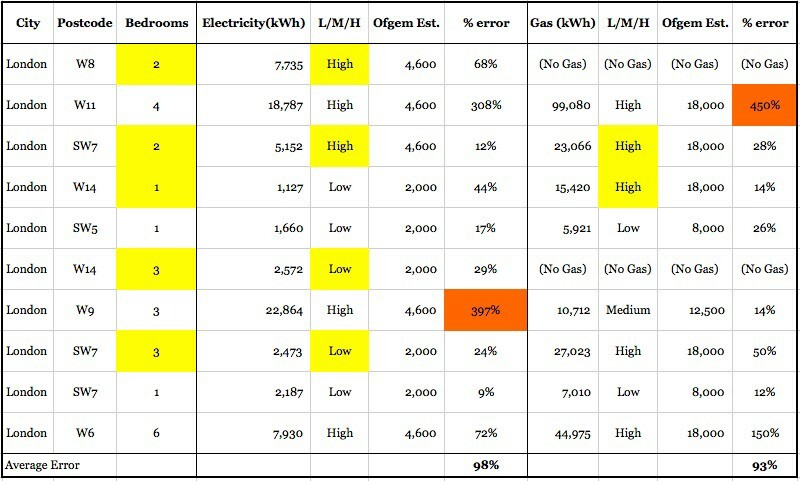 In the worst case, the error alone for gas was 4.5x the Ofgem predicted annual consumption, even with the right category selected. For electricity the highest error was about 4x predicted annual consumption. Number of bedrooms is a bad predictor of whether you are a Low, Medium or High consuming household — In 5 out of 10 cases here the number of bedrooms was an incorrect predictor for at least one fuel. Many people buying into energy deals on websites using estimators are doing so on the basis of numbers that may be wildly incorrect. They are being mislead into deals that they would not have chosen if the information were based on real numbers. This could even result in households ending up paying significantly more than before switching their tariff. 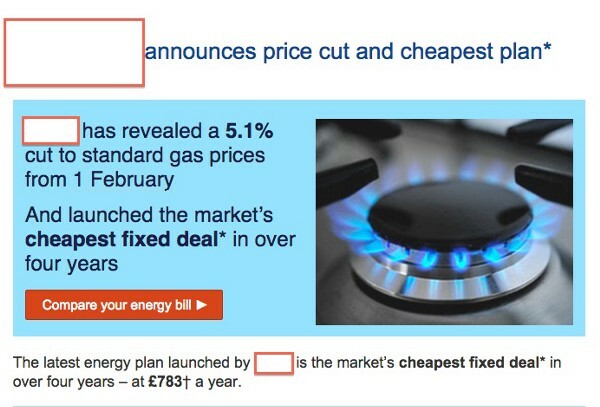 Bad estimates find their way back into energy advertising in the form of ‘save up to’ messages. Visitors to sites are switching based on estimated quotes that do not reflect what the real effect of the change in tariff on their spend will be. They don’t really know how much was saved in real life. They just made some estimates. When comparison sites make claims like “save up to £567 a year*”, they are using these incorrect numbers to promote their services. In this case, the small print will state that 10% of their customers have saved over £567 on their annual spend, in the last 3 months. However, the comparison sites never track how much money their customers are actually saving. They simply don’t have access to that information. This is just based on their estimates, often using inaccurate averages. The ‘save up to’ number is made using estimates from quotes, many of which were, of course, produced using averages. Those quotes could be totally inaccurate and in reality, many of the switches during the measured period will not have resulted in anywhere near the estimated savings. Using those savings quotes, or averages based on them, as a way to market a service, is ultimately misleading. The ‘save up to’ number is not a measure of how much money people save by using the service in real life. It was not possible to write this piece without a mention to Flipper’s solutions for some of the problems mentioned. *Flipper has developed unique and effective ways to solve the problems faced by home-movers, so they can accurately get the actual best deal for them. **Flipper tackles the problem of resorting to averages by making it easy and convenient for anyone to benefit from accurate switching using the actual consumption figures directly from their supplier.